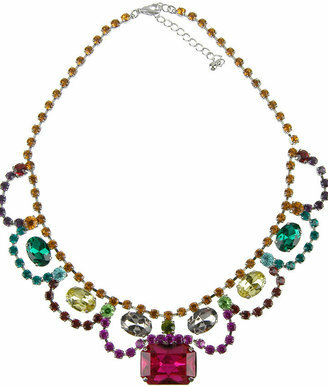 Browse the entire Erickson Beamon for Target collection. As much as I LOVE forever 21, they really do steal from other designers..
Eh, yes, and no. I'm not really sure how unique I'm willing to say the design is, and they went for something more elaborate (and in icky colors, I think) on the F21 necklace. 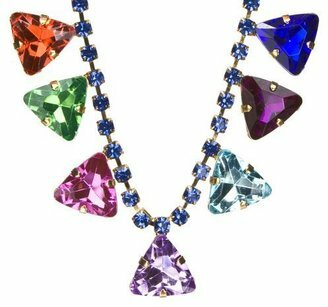 I am always amazed when I go to The Accessories Show how much trendy jewelry is out there, and how different but the same most of the jewelry is. hey..I must say I like them both a lot. Forever 21 & Target have both been guilty of producing knock-offs. ANY affordable but trendy clothing store would. It's not new news that F21 produces knock-offs/inspired pieces of accessories & clothing. That's what they're partially known for. I agree. I liked the F21 one for the same reason. Althoguh, I'd be worried to buy it...their jewelery always seems to stain my skin! it looks similiar but i dont see how it is a knockoff of target. also.. the f21 piece is ugly. i'm sure we can find TONS of styles at f21 that are a copy of other designers! (but not exact copies)...which are great for us budget people ..
Actually, I've bought stuff from F21 and a few months later seen the same thing at Target. For more! And they were the exact same material and everything. I wonder if they both buy stuff from the same manufacturer.